During the ISO process we observed several flaws of procedure, this page is a non-comprehensive collection. This is just a collection, please mail to gro.iiff|bulc-lmxooon#gro.iiff|bulc-lmxooon. …one member isoc.nl …finds that it would be appropriate for the submitter of a standard to refrain from voting this actively, especially because Microsoft had already given out a press release that the result would become "abstain" before the vote was actually being held. In other words, they knew they were going to sabotage(*) the dutch "no with comments" vote and told the press in advance. TC-173 formed without due procedure in a "first-in" selection, representativity questioned, refused participation for alleged representativity and lack of chairs in the room provided when an auditorium was available, president with conflict of interest and quality vote. Microsoft, as presidente of TC, Instituto de Informática (Informatics Institute), as organizer of the TC, and Instituto Português da Qualidade (Portuguese Institute for Quality) all claimed that CONDITIONAL APPROVAL is APPROVE WITH COMMENTS, contrary to the rules, which were confirmed by Alex Brown at the BRM. A TC-173 member representing the City Hall of Cascais has a doubtful representativity: the City Hall's Ombudsman informed that the It Division is who has the necessary competence, and the IT Chief of Division declared there isn't a Pro or Con opinion on OOXML. When questioned also for the lack of technical participation (ie, only being present to vote in favour of Microsoft) his defense was literally "My participation has been my vote". On February 19th, 2008, Microsoft, together with JP Sá Couto (who is a member of TC-173) and ISCTE (who had a prominent member participating in TC-173 as an "individual", officially representing himself) announced the opening of a Microsoft Innovation Center in Portugal. Both voted in favour of Microsoft without any technical discussion. This is a clear sign of, at the very least, an undue conflict of interest. The working group within SIS responsible for DIS 29500 was originally 9 members, later expanded to 12. The group had discussed DIS29500 for months, and was reportedly very likely to decide on "disapprove with comments", with a reasonably sized list of agreed-upon comments. At the final meeting, 23 new members (Google Sweden plus 22 Swedish Microsoft partners) showed up and registered for participation. Instead of reaching a consensus on "disapprove with comments" a majority vote was forced, and the result was, not surprisingly, "approve" without comments. With this sudden and huge last-minute change to the committee, the vote was effectively bought by an obviously coordinated effort from Microsoft partners, and all the work in the committee was ignored. Registration for SIS and group membership was SEK 17,000 per member (approx. EUR 1,700), so the vote was changed by paying for 22 members, a total of less than €40,000. Microsoft damage control in the US quickly took over the official information flow in this issue. They emphasized that it was only a single case of one stupid Swede going crazy in a small local branch who did this, and that it had no influence on the vote. Everything else in the entire matter worldwide had been handled by the book. Evidence certainly suggests otherwise, but it was perhaps only here they actually broke the law by offering outright payment and telling people exactly what to do in a written message which left a trail. A couple of days later, SIS published a press release stating that the vote had been invalidated for formal reasons, because "one member had participated with more than one vote". No further details were disclosed. The lack of a clear explanation and the unwillingness from SIS officials to comment further on the matter suggests that this was a last effort from SIS to save face and at least not send in a vote that was in direct contradiction of the result of the working group. There was not enough time to assemble the group for a re-vote, and not all members of the group agreed to an e-mail vote, so SIS never reached a formal decision. As a result, not even a formal notice of "abstain" was sent to ISO from Sweden, SIS simply failed to send in a vote. As a consequence, Sweden, (a P-member of SC34) was prevented from taking any active part in the standardization process. A large number of comments on defects sent in by Swedish technical experts were never forwarded to ISO. Of the 22 Microsoft partners suddenly signing up for participation in the SIS working group, none showed up on any subsequent meeting, and none paid their membership fee for the following year. I would like to report irregularity in Egypt as well. I heard that MS asked as much as its partner to join the Egyptian Organization for Standards committee. MS has used those partners to vote Yes without comments and successfully gained majority inside the committee. They imposed the retaining of last Sept Egypt's vote Yes whatever the result of BRM meeting. This is clearly unclean play that MS used in most countries like in Sweden and other countries. Note about "Libyan case": Unfortunately it seems that ISO is the first one not following its own standards: Libya tried to submit its comments in ISO 19500-1:2005 (PDF/A) and ISO 26300 (OpenDocument), but they were not accepted by ISO itself. Nigeria committee stuffind ITrealms: "Out of the estimated 19 participants, only four supposedly represented civil society group, while the rest were made up of government officials and Microsoft partners." Pakistan presents: "About presents :) well Microsoft did sent out offer for a fully paid trip to Dubai to promote the awareness about Microsofts's contribution in Open Source and quite a few members did took the trip." Office Open XML is neither open nor XML, nor is it a general "Office" file format, as it is specifically tailored to Microsoft Office 2007. It has often been called "Open Office XML", even by Microsoft employees, indicating strong confusion with OpenOffice.org, a free software office suite supporting the ISO office document standard ODF. A better, less confusing name would be "Microsoft Office Document ML" or something to that effect. No other names of XML markup languages actually contain the exact phrase "XML". This is not a special kind of XML, it is a set of specific schemas for encoding of specific document formats using plain and ordinary XML. Furthermore, Microsoft further abuses the name by abbreviating it as "Open XML". This somehow suggests XML isn't an open standard, and that Microsoft is now remaking it as an open standard. 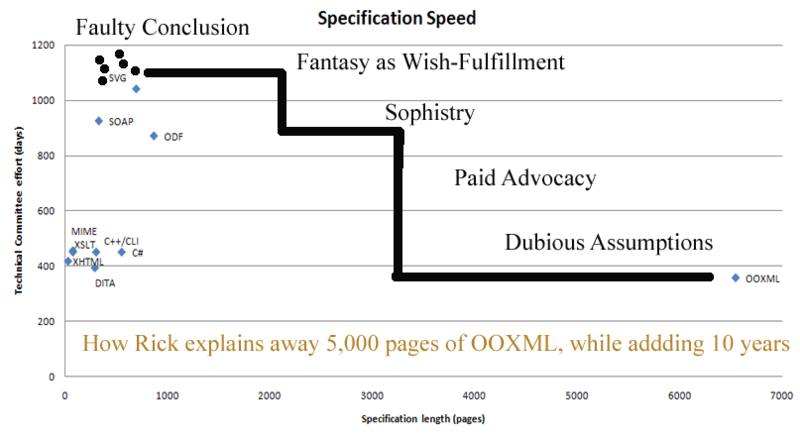 OOXML failed to provide evidence of its openness but has obvious proprietary hooks. The patent provisions do not give markets sufficient confidence. On loopholes, that’s another subjective call, but since Microsoft competitors managed to establish control over a standards initiative with potentially dire consequences for one of Microsoft’s most important business domains, we are not surprised that Microsoft (legitimately, albeit with what some consider to be poor standards etiquette) exploited the loopholes. As we noted, we assume ISO will update its procedures to eliminate the loopholes in the future.